Didymosphenia geminata is a freshwater diatom which has historically been found in cool, oligotrophic waters of northern Europe and northern North America. Since the mid-1980s, it has begun to take on the characteristics of an invasive species in both its native range and introduced regions (New Zealand). It can form massive blooms which have a range of adverse effects on freshwater ecosystems, as well as human and economic effects. 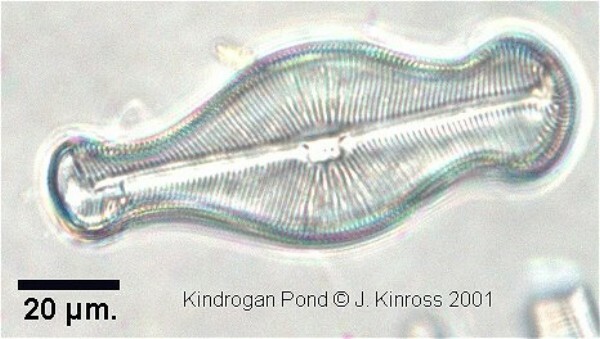 Didymosphenia geminata is a larger freshwater diatom (Kilroy, 2004). It can form massive blooms on the bottom of streams, rivers, and rarely in lakes. It is both epilithic (attaching to stones) and epiphytic (attaching to plants) (Round et al. 1990; in Kilroy, 2004), attaching itself by stalks, and it can form a thick brown layer that smothers rocks, submerged plants and other materials. It forms flowing ‘rats tails’ that can turn white at their ends and look similar to tissue paper. Although the algae appear slimy, it feels like wet cotton wool. (Biosecurity NZ, 2005). The mats consist mainly of the stalks, which contain no chlorophyll, and give the mat a pale yellow-brown to white colour (Ministry of Water, Land and Air Protection, undated). D. geminata is made up of cells that cannot be seen with the naked eye until large colonies form. It only needs a single cell to be transported for the algae to spread (Biosecurity NZ, 2005). These cells are distinguished by their large, triundulate frustule, shaped like a curved bottle, and prominent striae (regular lines of holes starting at the centre line of the valve faces) which are radially arranged and variable in length at the centre (Kilroy, 2004). D. geminata can be distinguished from other species of algae on the basis of: Colour D. geminata is beige/brown/white but not green. Touch Although it looks slimy it doesn't feel slimy, but rather spongy and scratchy like cotton wool. Odour Live D. geminata has no distinctive odour. Strength D. geminata is strongly attached to river stones and does not fall apart when rubbed between your fingers (Biosecurity NZ, 2005). It is unknown what has changed to allow Didymosphenia geminata to take on the characteristics of an invasive species, but connections between the features of the diatom (cell size, stalk composition), other organisms (mayflies, stoneflies, midge larvae) and the physical environment (stream flow, ultraviolet light, temperature, sediment) may play a role in explaining the dense growths of this diatom (Spaulding, 2005). One current theory suggests that the increasing occurrence of Didymosphenia geminata may be attributed to a genetic variant which has broader tolerances than the original species (Kilroy, 2004). It has also been suggested that Didymosphenia may proliferate because of increased exposure to ultraviolet (UV) radiation. This could occur because the UV reduces the grazer populations that normally limit accumulation of Didymosphenia, or because Didymosphenia outcompetes other algal species under increased UV conditions. Under this theory, warmer winters and reduced flows may favour growth of Didymosphenia - in other words, climate change may be linked to the current range expansion being observed for Didymosphenia (Kilroy, 2004). There appears to be some confusion as to the number of species contained within the genus Didymosphenia, with various species other than Didymosphenia geminata being identified in the literature. D. dentata was recorded from Lake Baikal and is described as having a valve exterior with occluded areolae, prominent marginal spines, dilated proximal raphe ends and distal ends that are deflected at 90 degree angles in the same direction. Ridges or flanges spiral around each spine. Stigmata are lacking. Internally the central nodule, raphe sternum and helictoglossae are prominent. D. dentata is said to differ from D. geminata in valve shape, presence of marginal spines and lack of stigmata. Recent suggestions that the two species are conspecific are not supported by observations presented in Kociolek et al (2000). Metzeltin and Lange-Bertalot (1995), in their taxonomic evaluation of Didymosphenia identified three morphotypes of D. geminata: geminata sensu stricto, capitata and subcapitata. They also recognised another four species: D. siberica (Grun.) M. Schmidt, D. curvata (Skv. and Meyer), D. clavaherculis (Ehr.) and D. pumila nov. spec. These can be differentiated by the structure of the areolae, which is profoundly different in D. geminata and D. clavaherculis compared to D. siberica, D. curvata and D. pumila. Didymosphenia geminata has been used as an indicator of oligotrophic conditions (Sahin, 2000). Didymosphenia geminata is found in freshwater rivers, streams and lakes. It occurs particularly in oligotrophic, clear-water montane or northern boreal streams (Kilroy, 2004). D. geminata thrives in clear, shallow, warm and nutrient-poor water, and is influenced annually by weather and rainfall patterns. High light and stable flow conditions are also favourable for D. geminata (Kilroy, 2004). It is normally found in water with pH=7, but appears to do well where there is some calcium (E.Y. Haworth, pers. comm., December 2004; in Kilroy, 2004). \r\nStable flow and a stable substrate are probably required for the initial attachment to the substrate. Most Didymo blooms reported occur in lake-fed rivers or in regulated rivers (below dams), ie., in freshwater systems characterized by relatively stable flows. Once a colony is established, fast currents are likely to enhance growth by promoting transfer of nutrients to the cells at the mat surface (Kilroy, 2004). An important habitat requirement for D. geminata is high light levels (Kawecka and Sanecki, 2003; in Kilroy, 2004). 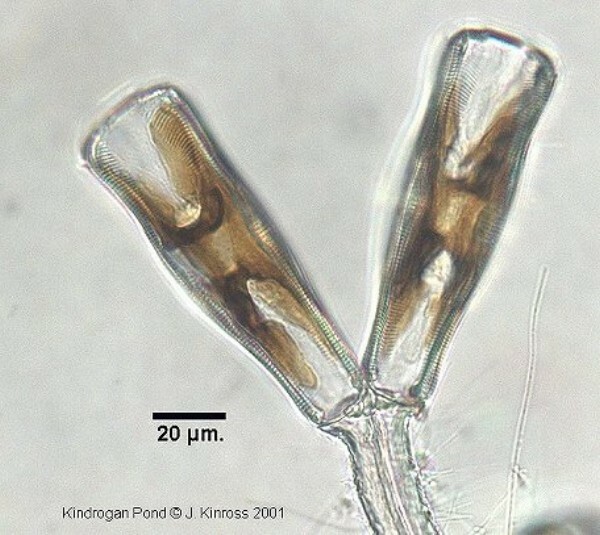 In British Columbia, D. geminata was found in depths from 10cm to 2m, with the heaviest biomass occurring in high-light areas (Kilroy, 2004). Detailed analysis of the blooms suggested that the distribution of Didymosphenia blooms may also be related to geological factors and temperature (Sherbot and Bothwell, 1993; in Kilroy, 2004). Didymosphenia geminata populations, like those of other diatoms, grow by vegetative cell division. The two valves of the cell each form a new valve which fits inside the original one, thus causing a gradual average reduction in cell size in a population (Round et al., 1990; in Kilroy, 2004). Each branch point in the stalk represents a vegetative cell division. Most diatoms also undergo sexual reproduction at some stage, which restores the size of the cells to their maximum (Kilroy, 2004). Didymosphenia geminata is a primary producer that contains chlorophyll. The arrival of D. geminata in New Zealand in 2004 indicates that it most likely arrived via human-assisted means, for example on footwear, fishing equipment, boats, etc. (Kilroy, 2004). Principal source: Kilroy, C. November 2004. A new alien diatom, Didymosphenia geminata (Lyngbye) Schmidt: its biology, distribution, effects and potential risks for New Zealand fresh waters. Review: Mads Solgaard Thomsen, Post doc, Benthic Section, Marine Department, National Environmental Research Institute University of Aarhus, Roskilde, Denmark. Recommended citation: Global Invasive Species Database (2019) Species profile: Didymosphenia geminata. Downloaded from http://www.iucngisd.org/gisd/species.php?sc=775 on 19-04-2019. Since the mid-1980s, D. geminata appears to have been gradually expanding its geographical range in North America and Europe. There have also been reports of it occurring in high abundances in areas where it has previously only been known in low levels (Whitton and Crisp, 1984; Heuff and Horkan, 1984; Skulberg and Lillehammer, 1984; in Kilroy, 2004). D. geminata can form massive blooms which can adversely affect freshwater fish, plant and invertebrate species, e.g. by reducing the number of suitable habitats and excluding the growth of other diatoms (Biosecurity New Zealand, 2005). Kilroy (2004) assesses the impacts of the spread of D. geminata in New Zealand. Some of the impacts include: an effect on the tourism industry, significant aesthetic effects, alteration in invertebrate communities, minor health effects and the possibility of spread to other rivers. Concerns raised by the Environment Protection Division of the Ministry of Environment, Government of British Columbia of possible impacts of D. geminata blooms include reduction in the rearing habitat for salmonid species, alterations in the species composition and poplulations of invertebrates, restriction of water flow and depletion of dissolved oxygen in the water due to decomposition of algal mats (EPD, undated). Potential impacts of the spread of D. geminata discussed by the MDDEP-MRNF report include a possible alteration of the species composition of benthic invertebrate communities which could affect fish populations; alteration in streamflow and an effect on recreational activities (MDDEP-MRNF, 2007). An electric fishing survey was carried out by the Ministère des Ressources Naturelles et de la Faune (MRNF), in the Matapedia river in Quebec, in early September 2006. Large D. geminata blooms had been observed in the river. The MRNF was not able to measure impacts on the abundance of juvenile salmons. The MDDEP-MRNF (2007) states that a similar observation had been made by fisheries experts and managers from France, Iceland, Ireland, Scotland, Finland and Norway. No impacts had been recorded on either adults or juveniles of Atlantic salmon or any other salmonid species. 1. Before leaving the river, remove obvious clumps of algae, taking care to search for hidden clumps which may be obscured within compartments. Leave clumps at affected site. After leaving affected area, if you find clumps, do not wash clumps down drains. Treat them chemically or by drying as below. 2. Soak and scrub all items for at least one minute in hot (60°C) water, a 2 percent solution of household bleach or a 5 percent solution of salt, nappy cleaner, antiseptic hand cleaner or dishwashing detergent. Note: For a 2 percent solution, add 200 mls to a ten litre bucket and fill with water. For a 5 percent solution, add 500 mls (two heavy cups) to a ten litre bucket and fill with water. If cleaning using the approved chemical methods in step two is not feasible, alternatively the infected equipment must be COMPLETELY dry for at least two days before it can be safely used in unaffected waters. Equipment that remains damp or could have pockets of trapped moisture after use will require longer drying times because the 48 hour drying time begins after dampness and trapped moisture have evaporated. Some equipment may never reach complete dryness depending upon how and where it is stored (shoes, waders, life vests, wetsuits, spray skirts, jet boat intakes, tyres, etc.) and therefore should always be chemically treated. Under no circumstances should fish, plants or other items be moved from an affected waterway to an unaffected waterway. Informations on Didymosphenia geminata has been recorded for the following locations. Click on the name for additional informations. Biosecurity New Zealand. 2007. Didymosphenia geminata: Affected Waterways. Biosecurity New Zealand. May 2005. Factsheet Don t spread Didymo. Summary: This fact sheet contains basic information about Didymo and how to prevent it from spreading. Cary, C. and Hicks, B. 2006. Didymo Detection Study: Project Brief. Gee, M. and Wells, R. 2006. Bibliographic Database on Controlling Benthic Algae Relevant to New Zealand (NIWA Client Report: CHC2006-019). Jellyman, P., Biggs, B., Clayton, J. and Blair, N. 2006a. Didymo Control Study: Project Brief. Jellyman, P.G., Clearwater, S.J., Biggs, B.J.F., Bremner, D.C., Clayton, J.S., Davey, A., Gretz, Hickey, C. and Kilroy, C. 2006b. Didymosphenia geminata Experimental Control Trials: Stage One (Screening of Biocides and Stalk Disruption Agents) and Stage Two Phase One (Biocide Testing) (NIWA Client Report: CH2006-128). Kilroy, C. 2005. Tests to Determine the Effectiveness of Methods for Decontaminating Materials That Have Been in Contact with Didymosphenia geminata (NIWA Client Report: CHC2005-004). Kilroy, C. 2006a. Didymo Monitoring Methods Study: Project Brief. Kilroy, C. 2006b. Didymo Survival Study: Project Brief. Kilroy, C. November 2004. A new alien diatom, Didymosphenia geminata (Lyngbye) Schmidt: its biology, distribution, effects and potential risks for New Zealand fresh waters. Prepared for Environment Southland by NIWA. Summary: This document summarised the international literature on D. geminata following the occurrence of the diatom in New Zealand in 2004. MAF (Ministry of Agriculture and Forestry)/Biosecurity New Zealand. 2005. Algae Management Options Under Review. MDDEP-MRNF Scientific Advisory Committee on Didymosphenia geminata, 2007. What Is Didymo and How Can We Prevent It From Spreading In Our Rivers?, Qu�bec, minist�re du D�veloppement durable, de l�Environnement et des Parcs et minist�re des Ressources naturelles et de la Faune, ISBN: 978-2-550-49391-4 (PDF), 10 p.
Spaulding, S.A. and L. Elwell. 2007b. Increase in nuisance blooms and geographic expansion of the freshwater diatom Didymosphenia geminata: U.S. Geological Survey Open-file report 2007-1425. 38 p.
Vieglais, C. and Kilroy, C. 2004. 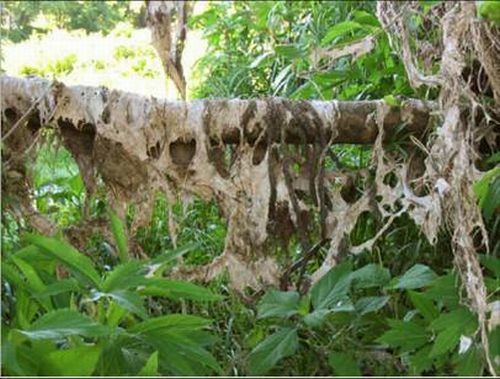 A National Incursion Response to the Invasive Diatom Didymoshpenia germinata in New Zealand Freshwaters. Akbulut, A. and Yildiz, K. 2002. The planktonic diatoms of Lake Cildir (Ardahan, Turkey). Turkish Journal of Botany. 26: 55-75. Summary: This paper gives details of a survey of the algae in Lake Cildir. Antoine, S.E. and Benson-Evans, K. 1986. Spatial and temporal distribution of some interesting diatom species in the River Wye system, Wales, U.K. Limnologica. 17 (1): 79-86. Summary: This paper presents the results of a study into the spatial and temporal distribution of diatoms in the River Wye system in Wales, including D. geminata. Edlund, M.B., Stoermer, E.F., Jamsran, T.S., Soninkhishig, N. and Williams, R.M. Undated. International Partnership for Research and Training in Mongolia- The diatom (Bacillariophyta) flora of ancient Lake Hovsgol. Checklist of Mongolian Diatoms. Summary: This website lists all diatoms recorded from Mongolia, including D. geminata. Environmental Protection Agency website. Didymosphenia in western streams. Summary: This website gives some details about the distribution and impacts of D. geminata in the USA. Guiry, M.D. & Nic Dhonncha, E., 2005. Didymosphenia geminata AlgaeBase version 3.0. World-wide electronic publication, National University of Ireland, Galway. Hedenstrom, A. and Risberg, J. 1999. Early Holocene shore-displacement in southern central Sweden as recorded in elevated isolated basins. Boreas. 28: 490-504. Summary: This paper gives details of freshwater flora and fauna from the early Holocene period in southern central Sweden, including a record of D. geminata. Kara, H. and Sahin, B. 2001. Epipelic and epilithic algae of Degirmendere River (Trabzon-Turkey). Turkish Journal of Botany. 25: 177-186. Summary: This paper gives details of a survey of the algae in the Degirmendere River. Kawecka, B. and Sanecki, J. 2003. Didymosphenia geminata in running waters of southern Poland - symptoms of change in water quality? Hydrobiologia. 495: 193-201. Summary: This paper details the history of D. geminata in Poland, and discusses possible reasons for the species recent appearance in the Carpathian tributaries of the Rivers San and Vistula. Kociolek, J.P., Flower, R. and Reid, G. 2000. Valve ultrastructure of Didymosphenia dentata (Bacillariophyta): An endemic diatom species from Lake Baikal. Nova Hedwigia. 71 (1-2): 113-120. Summary: This paper describes Didymosphenia dentata, reported from Lake Baikal, and compares its morphology with that of D. geminata. Kolayli, S., Baysal, A. and Sahin, B. 1998. A study of the epipelic and epilithic algae of Sana River (Trabzon/Turkey). Turkish Journal of Botany. 22 (3): 163-170. Summary: This study found D. geminata to be abundant in the Sana River in Trabzon, Turkey, in 1995. Kravtsova, L.S., Kamaltynov, R.M., Karabanov, E.B., Mekhanikova, I.V., Sitnikova, T. Ya., Rozhkova, N.A., Slugina, Z.V., Izhboldina, L.A., Weinberg, I.V., Akinshina, T.V. and Sherbakov, D. Yu. 2004. Macrozoobenthic communities of underwater landscapes in the shallow-water zone of southern Lake Baikal. Hydrobiologia. 522. 193-205. Summary: This paper gives the results of a study into the macrozoobenthic communities of Lake Baikal, where D. geminata is recorded as present. Li, Y., Xie, P., Gong, Z. and Shi, Z. 2003. Cymbellaceae and Gomphonemataceae (Bacillariophyta) from the Hengduan Mountains region (southwestern China). Nova Hedwigia. 76 (3-4): 507-536. Summary: This paper records the presence of D. geminata in the Hengduan Mountains in China. Metzeltin, D. and Lange-Bertalot, H. 1995. Critical evaluation of taxa in Didymosphenia (Bacillariophyceae). Nova Hedwigia. 60 (3-4): 381-405. Summary: This paper proposes five species of Didymosphenia, with three morphotypes of D. geminata. Sahin, B. 2000. Algal flora of Lakes Aygir and Balikli (Trabzon, Turkey). Turkish Journal of Botany. 24: 35-45. Summary: This paper gives details of a survey of the algae in Lakes Aygir and Balikli. Sahin, B. 2001. Epipelic and epilithic algae of Dagbasi Lake (Rize-Turkey). Turkish Journal of Botany. 25: 187-194. Summary: This paper gives details of a survey of the algae in Dagbasi Lake. Sahin, B. 2002. Epipelic and epilithic algae of the Yedigoller Lakes (Erzurum-Turkey). Turkish Journal of Biology. 26: 221-228. Summary: This paper gives details of a survey of the algae in the Yedigoller Lakes. Sahin, B. 2003. Epipelic and epilithic algae of lower parts of Yanbolu River (Trabzon, Turkey). Turkish Journal of Biology. 27: 107-115. Summary: This paper gives details of a survey of the algae in the Yanbolu River. Spaulding, S. 2005. Streams in western North America: environmental change or a diatom gone bad? USGS Central Region Colloquium Series. January-May 2005. Summary: This article briefly outlines the impact of D. geminata in the western USA, and possible reasons for its developing invasiveness.